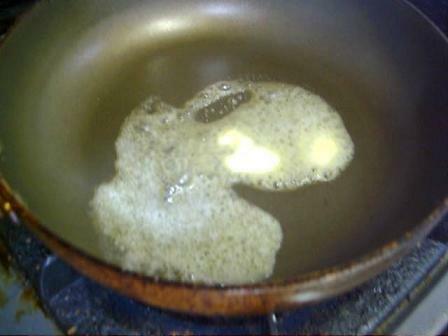 Turn on the stove and add oil (or margarine) to the frying pan. Fry the meat and onions, then add the rice, using a spatula to stir fry. 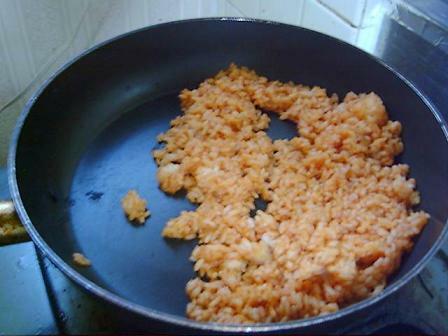 When it is fully cooked, add the ketchup and quickly mix it into the rice. If you don’t do it fast enough, it won’t be evenly spread. This means that you will have to move the pan around, but if you’re not good at it, you can just move the pan back and forth while quickly stirring with the spatula. It’s important to have a strong fried ketchup flavour. 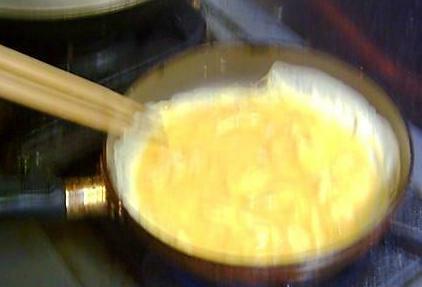 Heat the frying pan on medium flame and add margarine/butter. Mix four (4) eggs in a bowl until all of the egg white clumps are gone. Lightly mix them so that the omelette will be fluffy. Adding milk or cream will give it a smooth, glossy surface, but it will be hard to make it smooth so don’t add too much. 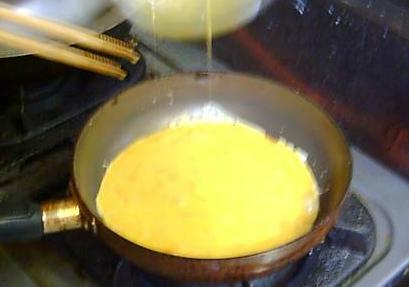 Pour the egg mixture into the frying pan when it is hot enough. You’ll know that the temperature is sufficient by the sizzling sound of the butter. 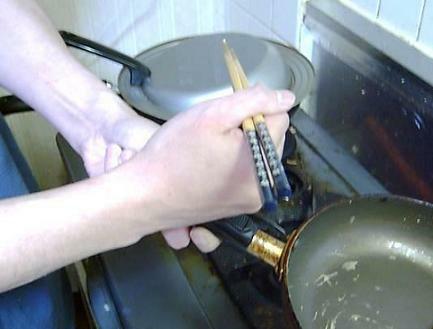 Quickly stir the eggs with chopsticks by making large circular motions. The idea is to have the egg cook from the outer edge towards the inside. 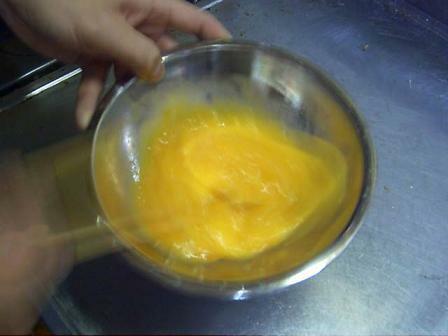 After 3-4 large motions, the egg will be almost half-cooked. Start gathering the egg together on the pan before it gets to the half-cooked point. 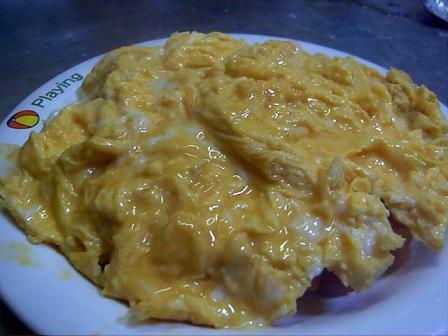 In order for it to be half-cooked when you are done, after pouring the egg onto the pan you should start gathering it right away while doing the mixing. If you don’t mix it quickly then it won’t be half-cooked at this stage. Until you get used to it, you should turn the heat down to low flame while gathering the egg together, so that it doesn’t burn. Lift the frying pan on an angle and use the other hand to tap on the handle, bringing the egg towards you from the edges of the pan. The idea is to have your active hand in a fist, and instead of tapping the handle itself, tap on the hand that’s holding the handle. Tap using a bit more strength than you would when clapping your hands. Watch while turning the pan to make sure it forms the right shape. Ideally you want about 3-4 taps across one rotation. This picture illustrates the above idea (tapping hand instead of handle). 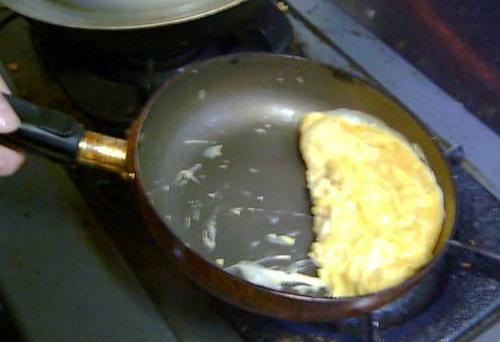 After one rotation, the omelette is done. In the event that the egg is cooked too much by the time you finish the rotation, turn it a bit more so that the nicest-looking side faces up. 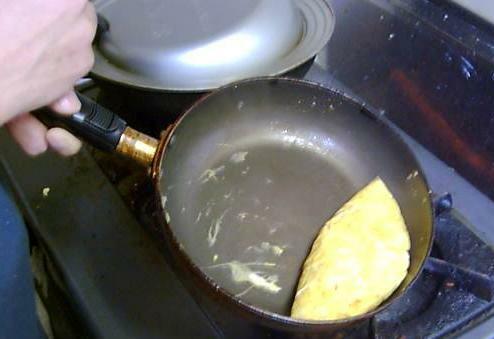 Quickly take out the egg so that the remaining heat doesn’t make it harden. 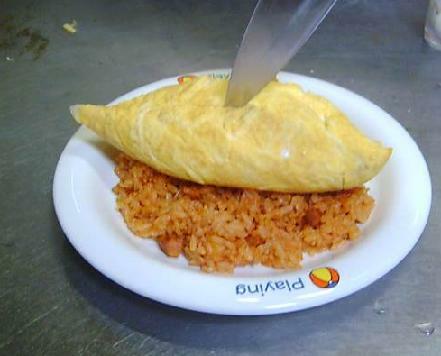 Place the omelette on top of the rice, and slice it through the middle with a kitchen knife. 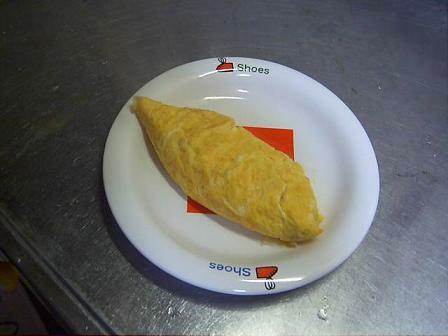 When both sides open, your omurice is done. 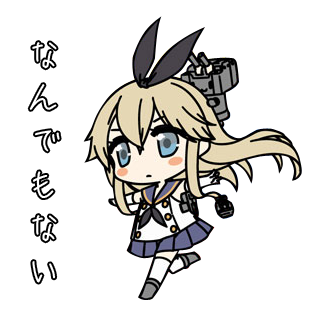 The most important thing is to prepare it very quickly.